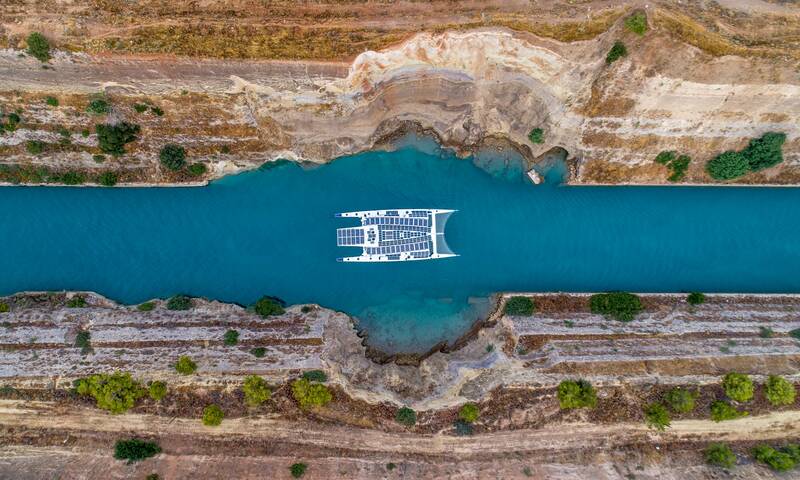 Five years on, that idea has taken physical form in the Energy Observer, a catamaran that runs on renewables. In a mission reminiscent of the Solar Impulse 2, the solar-powered plane that Bertrand Picard and André Borschberg flew around the world a few years back, Erussard and teammate Jérôme Delafosse are planning to sail around the planet, without using any fossil fuel. Instead, they’ll make the fuel they need from sea water, the wind, and the sun. Almost every horizontal surface on the white catamaran is covered with solar panels—1,400 square feet of them in all. The voyage, which started in June 2017, will last six years, reach 50 countries, and make 101 stops. The vessel has already travelled 7,000 nautical miles, to port cities around the French coast, and is now in the Mediterranean. The team isn’t rushing things. The mission started in June 2017, and will last six years, reach 50 countries, and make 101 stops. The vessel has already travelled 7,000 nautical miles, to port cities around the French coast, and is now in the Mediterranean. It’s due to arrive in Venice on July 6, and spend 10 days in port, where the crew will meet the public, and hold set up an interactive exhibit to showcase environmentally technologies. “The idea with this ship is to prove a potential energy system of the future,” Erussard says. He’s determined that the same types of energy generation and storage that he’s using onboard could be used on land too, to reduce dependence on fossil fuels, and maybe one day to clean up those container ships he’ll pass en route.